Fresh out from collaborations as backing vocalist for Ani DiFranco and Peter Gabriel (she took Kate Bush's place on the re-interpretation of "Don't Give Up" on Gabriel's last album "New Blood"), Norwegian born, Sweden-based Ane Brun came out with her fourth studio album "It All Starts with One" on her own label Balloon Ranger Recordings in September this year, three years after the goldmine "Changing of the Seasons". 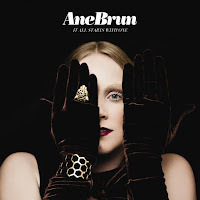 Ane Brun is indeed no newbie, she is already a huge star in Norway and Sweden for half a decade, besides those four studio albums, Ane Brun released two compilations and two, yes two, live albums. "It All Starts with One" could very be a prophetic title, she just need one album to make her international breakthrough and this album could definitely be the one. Ane Brun is first and foremost a folk singer/songwriter, she could very probably be one of the best of the last decade, just take a listen to her first and rather traditional album "Spending Time with Morgan" (2003) to be very much intrigued, then get on with the next and more worked out "A Temporary Dive" (2005) to finally feel the ultimate bliss, if a very melancholic one, with "Changing of the Seasons" (2008), there is not one bad song, not even an average one on any of the three albums. Besides, Ane Brun is a very gifted and imaginative composer, it looks like she's able to write exquisite melodies as easily as I make coffee - I don't use a coffee machine. Last but not least, she is a fantastic singer with a pretty unique and absolutely beautiful bright expressive voice. Oh, and did I mention she's a very decent guitarist? Well, she is, but on her last opus she has decided to trade it with keyboards (piano and synths) on about half of the songs, and this is already one metamorphosis compared to her previous albums. The second important change is the presence of not one but two drummers. By doing so, Ane Brun take a step away from acoustic folk to get closer to pop music in its largest meaning. The first surprisingly uptempo and catchy single "Do You Remember" already gave an idea of where Ane Brun was going on, and then not really because that single remains sonically and rhythmically the jolliest on the album, with a strong wink to Lykke Li's own "Get Some" and that near African tribal drum patterns (both ladies share drummer Per Eklund). Now Ane Brun hasn't given up at all on her near aching subdued acoustic melancholia, "It All Starts with One" contains among her most delicate and moving songs, namely the very bare and fragile "Lifeline" where Ane Brun delivers one of her best vocals accompanied by a squeletic acoustic guitar, tiny drops of synth and some very light vibraphone, the other one being the more arranged "Words" with a sweet meandering synth moan, percussion drops, soft tom-toms, some discreet backing vocals and a feather-like string orchestra; the refrain is quite reminiscent of some introvert Regina Spektor, an extremely touching song. More orchestrated, with the drums being now present in the mix, but still delicately performed, is the highlight "Worship", a duet with Swedish-Argentinian José Gonzalez and his downbeat vocals, it works like a hypnotic rondo, repetitive and fascinating all along its six minutes mark. The other pearls on the record are the two sister tracks "One" and "The Light from One", two songs inspired by the recent revolutions in the Middle Easts and North Africa, the former resembling a cabaret song, theatrical and emotional, the second, and a favorite of mine, with its haunting piano, slow paced drums and Ane Brun's near parlando narration until she enters the refrain "I need both my hands to hold my own, I need only one light, the light from one", the pace of each words and Ane Brun's near trembling vocals make this song a near painful but beautiful experience. The last song on the album "Undertow", also lead by a piano accompaniment, is another jewel full of emotion without sounding sentimental, with its slight burst of strings and percussion, Ane Brun's voice rising above all the instruments like a sailor crying for hope in the storm. A perfect ending for the album. All that said, I have some reserves here and there, three songs stand below Ane Brun's high standard : the opener and rather bland "These Days", the quite lame "What's Happening With You and Him" and the very traditional sounding acoustic ballad "Oh Love" and its obvious lalala backing vocals, even though the lyrics of the latter are spot on about how hard it is to believe in the miracle of love. Another gripe is the string arrangements, they are pedestrian and decorative for the most part, they don't bring anything much to the songs - well, it is hard to compete with Nico Muhly's magnificent job on "Changing of the Seasons", which remains for me Ane Brun's masterpiece to date. Finally, the sound production is sometimes too soft, too polished, surely the song "Do You Remember" could sound more tribal, rougher, wilder, the potential powerhouse of two drummers was quite underused here. It is interesting to listen to this song and Lykke Li's "Get Some" side by side to realize how much ballsier the rhythm sounds on Li's song. "It All Starts with One" is a transition album in Ane Brun's career and many transition albums sound unfinished, sloppy and all over the place, this is surely something one can not say about this album : "It All Starts with One" is more than recommendable and it will enchant many of your autumnal evenings. As a side note, this album is giving me a similar feeling for the autumnal season as Joni Mitchell's masterpiece "The Hissing of Summer Lawns" for the summer, one made me think of the other, without sounding in anyway like each other, and now there will be a reciprocity.